12apr8:30 AMEaster Basket CollectionDonate an Easter basket and bring joy to a child this Spring! Each Spring, Friendly Center sets a goal to collect 1,000 Easter baskets to distribute to less-fortunate children through its network of centers in Orange County. You can contribute by dropping-off your baskets on collection day, containing the items below, at one of our two drop-off locations. Volunteers are also needed to help distribute baskets on distribution days as well as volunteers to hosts craft tables. Note: Please wrap baskets in cellophane. Baskets for children up to 6th grade. 28jun11:30 AMAnnual Golf TournamentEnjoy a day on the greens and help less-fortunate kids find success! Show your support on the greens by participating in our annual golf tournament. This year the tournament will be held at Black Gold Golf Club in Yorba Linda. Golfers will enjoy a day of golf, raffle prizes, goodie bags, and the awards dinner immediately following the tournament. Proceeds from this event supports our after-school tutoring program which includes S.T.E.A.M. components (Science, Technology, Engineering, Arts, Math) that enhance our students exposure to future careers and secondary education. Please call (714) 769-8869 with questions about sponsoring or volunteering. 30augOrange International Street FairVisit our booths, support our mission, and enjoy the fair! The Orange International Street Fair is such a special time for Friendly Center. Located in the Orange Plaza over Labor Day weekend, the fair has featured food and live music for over forty years. Friendly Center hosts a food booth and beer booth in the Mexico area, serving great Mexican food. Come visit or sign-up to be one of 100 volunteers that we utilize in our booths for the weekend. This is a great opportunity for groups to get involved. 26oct6:00 PMAnnual GalaJoin us for an evening of excitement with fellow supporters! Join us for an evening of celebration and support. Each year, our fundraising gala brings together generous donors, new and old, to celebrate the accomplishments of Friendly Center as we look forward to what’s to come. 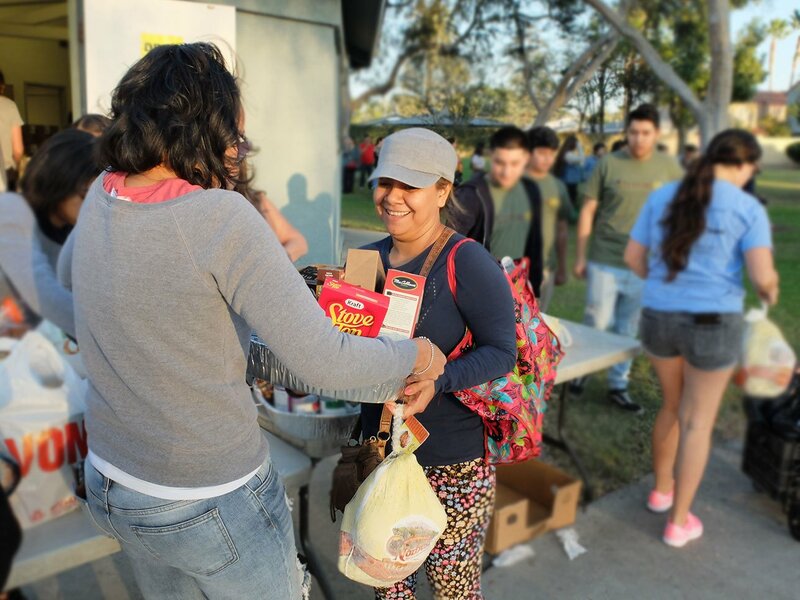 You can help support our vital mission to end poverty for families in Orange County. This is an especially exciting year as we celebrate our 95th Anniversary! You won’t want to miss this historical time! Please call (714) 769-8869 with questions about sponsoring. 01novAll DayAdopt a FamilySign-up to adopt one of our neediest families for the holidays! Our Adopt a Family program is a special time that allows adopters to purchase items specifically for a few select families that have been part of our case management program during the past year. These families are of various sizes and have varying needs. Adopters will receive a wishlist from the family, from which the adopter will purchase gifts for the entire family. The drop-off dates of the items occurs the week prior to Christmas. If you are interested in adopting or have any questions, please call (714) 769-8869. 26nov8:30 AMTurkey Basket DriveDonate a Thanksgiving dinner for a family to enjoy at home! 01decAll DayToy DriveLet your gift brighten a child’s life this holiday season! Put a smile on a child’s face this holiday season by donating toy. We will be collecting toys through December which are provided to children in the community. You can help by organizing a drive to collect toys with your work, school, or church. Setup a box to collect with, then drop off what you’ve collected. To schedule your drop-off or if you have any questions, please call (714) 769-8869. 01decAll DayHoliday OutreachVolunteer during the season of giving! The holiday season is a special time around Friendly Center as there are so many opportunities to get involved. Volunteers are needed to help with distributions, toy bagging, hosting craft tables, and sharing friendly smiles with families in need. Opportunities are available at our Orange and Placentia locations. Great time for groups to be involved. Please take a look at our sign-up page below for available shifts and times.